According to statistics, there are over 2.2 billion users on Facebook, out of which fake profiles on its platform account for around 4%. That means, out of 2.2 billion active users, there are around 88 million fake profiles. Somebody creating a fake profile of yours is not a big deal for Facebook unless you represent a law enforcement agency or an expensive legal firm. Most fake Facebook profiles are set-up by adolescents in relationships seeking to either destroy the reputation of their ex-partner by uploading private pictures or to just stalk on other people. While there is another group of people who use fake profiles for spamming, spreading promotional content, building fake page likes, etc. Someone stole my daughter’s picture from her Facebook page & created a fake account. now that person is sending abusive messages from that account to everyone & trying to ruin her image as she is a very sincere girl. This profile is creating chaos in my neighborhood which was identified as her. Could you please hack this fake profile for me? I often receive such requests from people who find themselves or their relatives in this situation. Identity theft on Facebook is very common, But somebody using your image to harass or play with other people you know, thereby defaming you is really embarrassing and malicious. While you can always report such imposter’s on Facebook using their report form, it takes hell lot of time for Facebook to review the profile and disable it. Also, Facebook will never disclose to you any details about the fake profile, like when it was created and from which computer or network it was operated. Facebook is bound to disclose Information regarding fake profile only when there is police intervention and this is indeed a very long process. Moreover, the police will not go through the hassle of contacting Facebook and behave like loyal dogs to track down the imposter unless the matter is very serious. If the matter is serious, police will contact facebook with all the information about the fake profile in question. Facebook will then investigate and will get back to police officials with geo information about the fake account, like the IP address & devices being used to access the account, basic profiling of the said culprit and his private messages. Once they have the IP address of fake profile user, they will then need to get a court order for the ISP to reveal the information and billing address of the person involved to find out who made a fake facebook account over this network. Remember, if the fake profile user had used a proxy server to hide real-IP, it would be very difficult to trace a fake FB account holder. Here in this post, I will show you how exactly you can get someones IP address from Facebook and teach you how to trace fake Facebook profile to nab the culprit. All I will be doing is, apply some social engineering skills and use default ‘Banner grabbing’ technique of a web server. Collect as much information about the fake profile as you can and identify all of the people who are connected to it as friends. Make a list of connected people to this account who are your real life friends. Select any of your close friend or relative on that list. The person which you have selected will be doing all the job for you. If there is nobody in his friend’s list that you know personally then you can always create a new account or ask one of your friends to just befriend this fake user and make a contact. In this step, we are going to create a specially crafted tracking URL that will fetch us all the details of the fake profile user (banner grabbing). 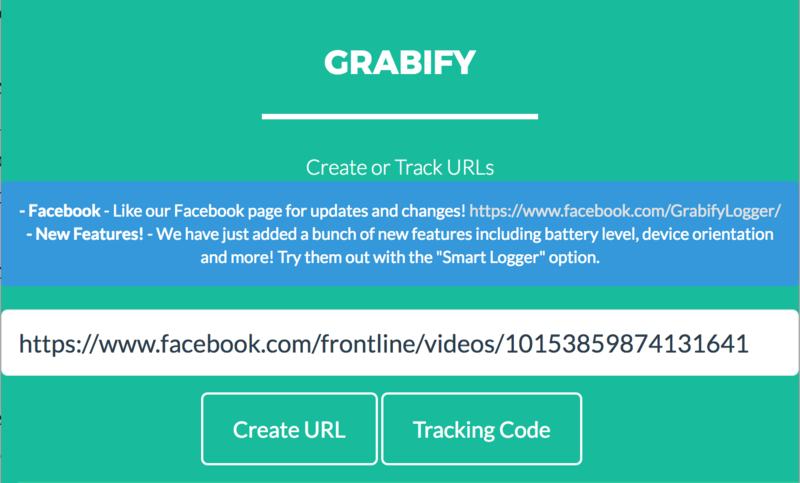 Goto https://grabify.link and enter any URL(user will be redirected to this URL once he clicks tracking link) in the text field and click “Create URL” to generate tracking URL and Code. TIP! You can find the list of other tracking tools here: List of IP tracking tools (Tracing Facebook user location). In the next page, you will get all the tracking information as shown below. New URL: This is the tracking URL that you need to send to your target user. Tracking Code: Note down this code as you will need this code in future to access your tracking data. Other Links: Here you can create a short link for your “New URL”. Click on “View other link shorteners” and then generate short URL using goo.gl service. You will get something like this: https://goo.gl/mC5gFF. Copy the newly created short tracking URL. As soon as the fake user clicks on the tracking link, his IP address gets recorded on Grabify’s server. To check for the recorded IP, just go to https://grabify.link and enter your “tracking code” to view your Link Information page. The logged IP addresses will be listed in the RESULTS section. Now that you have found out the IP address of the fake user, it’s time to know more about this fake user. Go to http://www.iptrackeronline.com and enter the ‘IP address’ of the fake user, click submit query. On the new page, scroll down a bit and you will get to see all the details like ISP, Area-code, Postal-code, etc. regarding his IP address along with a Map. Relate these details with the suspect. If you are not able to suspect anyone then approach your attorney or lawyer, he will file the necessary documents for the ISP to disclose the subscriber details for the IP address. If you are suspecting anyone but not sure if it’s him then repeat the steps 3 to 8 for this suspect. You can take help of the same friend and ask him to craft some different message accompanied by IP tracking link for this suspect. As soon as your suspect clicks this link, you will have his IP address. Now match his IP address with the IP address of the Fake user. If there is a match, well congrats!! you have successfully nabbed the culprit. Also, read our Advanced Guide: Trace Facebook user location using USER-Agent and IP address. Hope this tutorial answers your question: how to get somesones IP address from Facebook and then trace fake facebook profile. If you have any questions regarding fake profiles, Let us know via the Comments Section below. Earlier, I had posted about finding Facebook users IP Address through chat and email header, but none of these two methods work this day. The Facebook chat runs on XMPP protocol now which is not peer-2-peer, so it is not possible to determine the IP address of the user through Facebook Chat using Netstat command.